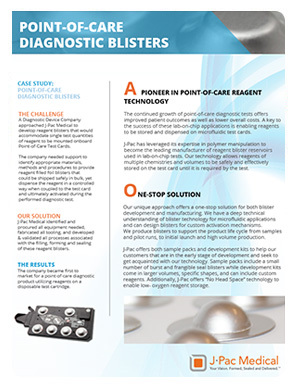 As diagnostic tests move closer to the point-of-care, reagent storage and delivery methods become a challenge. J-Pac Medical’s lab-on-a-chip reagent blisters allow reagents to be stored directly on the microfluidic cartridge, enabling the smaller footprint required by point-of-care diagnostic tests. The continued growth of point-of-care diagnostic tests offers improved patient outcomes as well as lower overall costs. A key to the success of these lab-on-chip applications is enabling reagents to be stored and dispensed on microfluidic test cards. J-Pac has leveraged its expertise in polymer manipulation to become the leading manufacturer of reagent blister reservoirs used in lab-on-chip tests. Our technology allows reagents of multiple chemistries and volumes to be safely and effectively stored on the test card until it is required by the test. 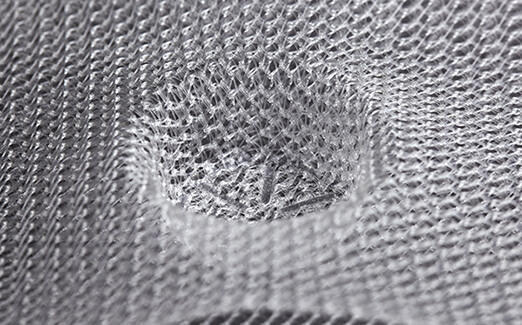 Our unique approach offers a one-stop solution for both blister development and manufacturing. We have a deep technical understanding of blister technology for microfluidic applications and can design blisters for custom activation mechanisms. We produce blisters to support the product life cycle from samples and pilot runs, to initial launch and high volume production. J-Pac offers both sample packs and development kits to help our customers that are in the early stage of development and seek to get acquainted with our technology. 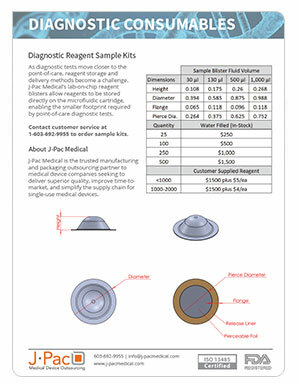 Sample packs include a small number of burst and frangible seal blisters while development kits come in larger volumes, specific shapes, and can include custom reagents. 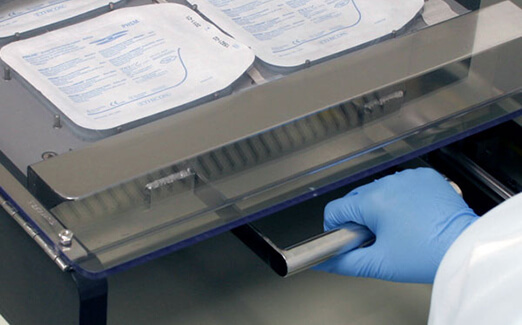 Additionally, J-Pac offers “No Head Space” technology to enable low- oxygen reagent storage.